Hello! 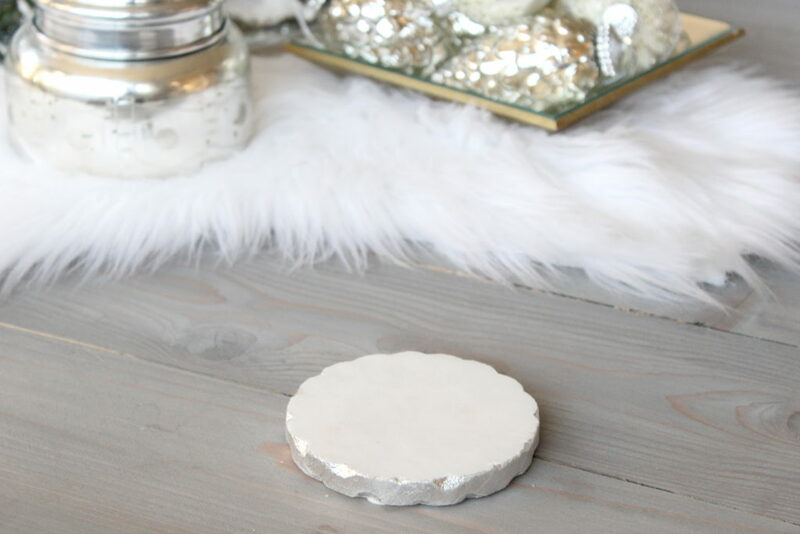 We are so glad you could join us today for our monthly addition of “Styling A Coffee Table” Blog Hop, hosted by Janine from Happy Happy Nester. 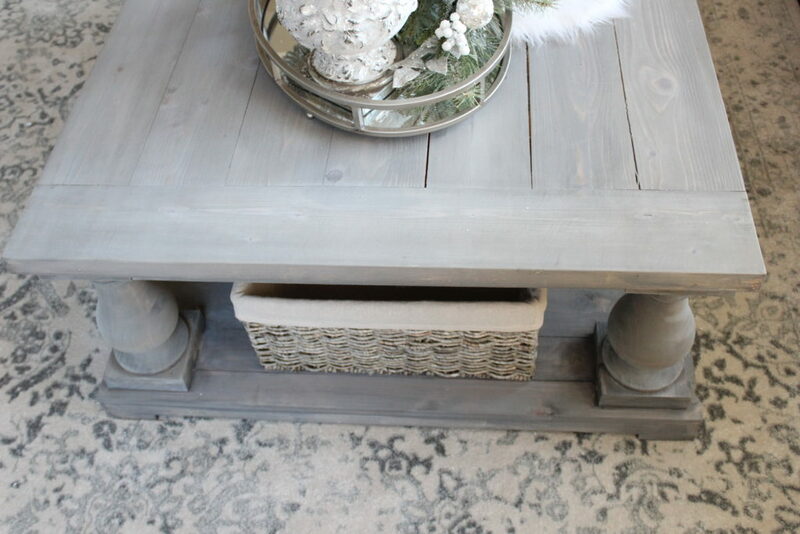 A group of home decor/lifestyle bloggers are getting together once a month to share how our coffee tables are styled. There’s no better way to make a change in your home than styling a coffee table differently. You can shop your own home and move things around and create an entirely new look. If it’s a holiday, there’s no better time to create a bit of magic on your coffee table and put together something beautiful. If you struggle with putting together or styling your coffee table, you’re in the right place today! If you came here from my talented and gorgeous friends, Kim & Lacey at Styled With Lace, welcome! They have such exquisite taste and always style their coffee tables and homes so perfectly and beautifully. And welcome back to my regular visitors! I’m always glad you are here. Last month I shared this fall coffee table HERE. 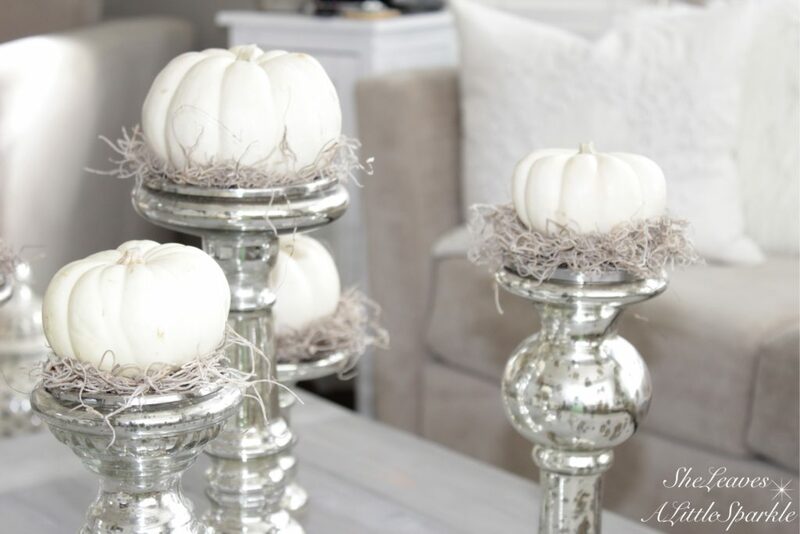 I used mercury glass candle sticks to add some glam. 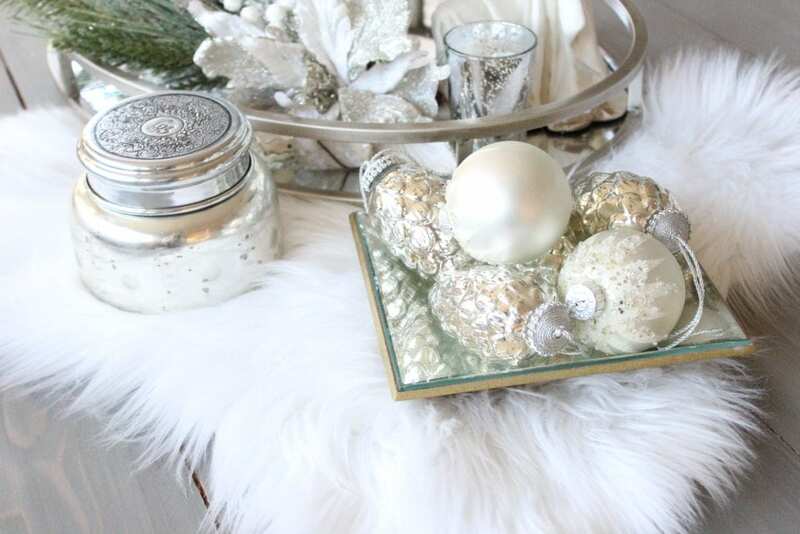 This month, I am decorating for Christmas and definitely wanted to keep the glam while adding some sparkle. Next month I’ll share my gold coffee table with you for Christmas but this month I’m going to share my family room living room again. I love this coffee table and it’s large size. Just like THIS coffee table in September, I decided to use that fun piece of fur again to bring in that cozy element. I bought this fabulous mirrored tray last month and I love that it is oval since this is such a large, rectangular table. 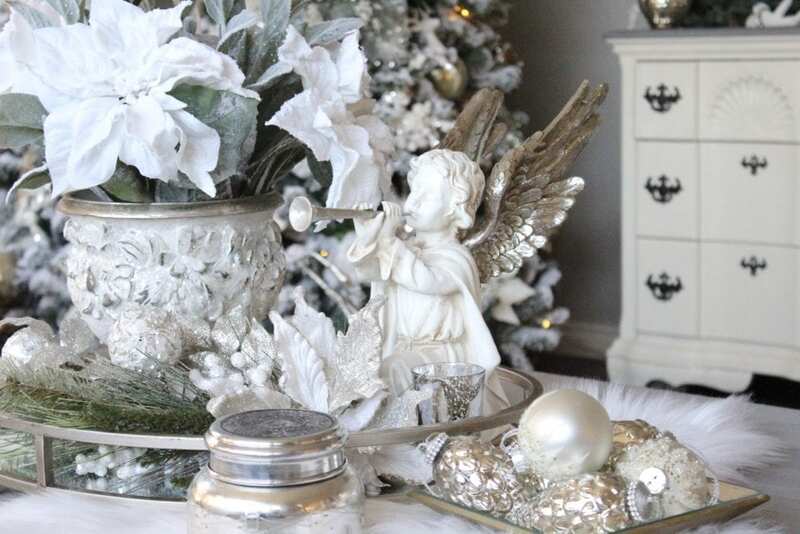 I recently found this beautiful angel at Christmas Decorators Warehouse here in Arlington, Texas. Isn’t he just beautiful? I adore his gorgeous silver wings. 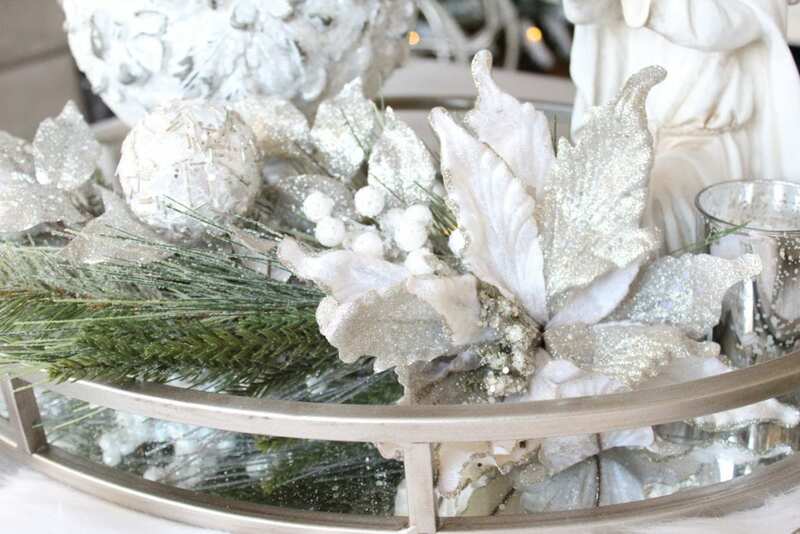 While in that same store, I came across this sparkly white Christmas planter and I knew it had to come home with me. 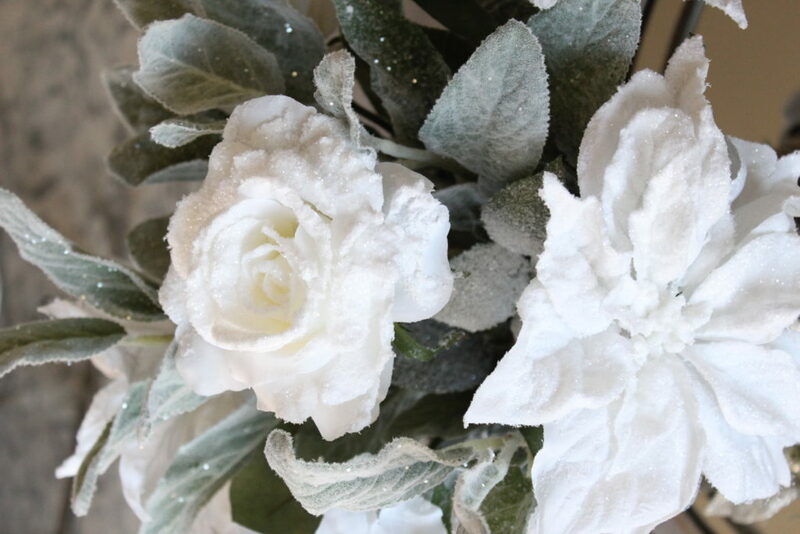 I had recently seen these frosted winter roses and poinsettias at Michaels and this soft, frosted lambs ear. I could already see the arrangement in my head. Perfect! 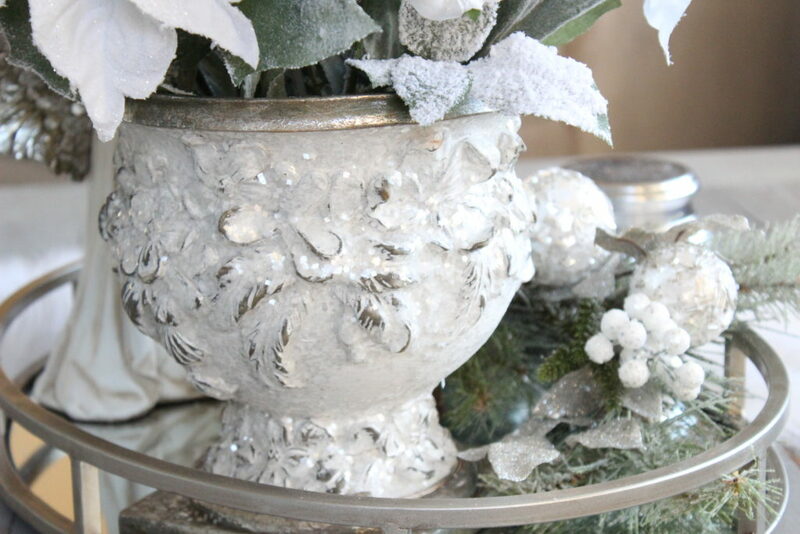 I also found this beautiful white and silver Christmas poinsettia swag at the Christmas store. It was the last one. Perfect for adorning a tray, don’t you think? There you have it…a beautiful tray on a beautiful fur and on a beautiful table. But I wasn’t done. I had to add my favorite candle. 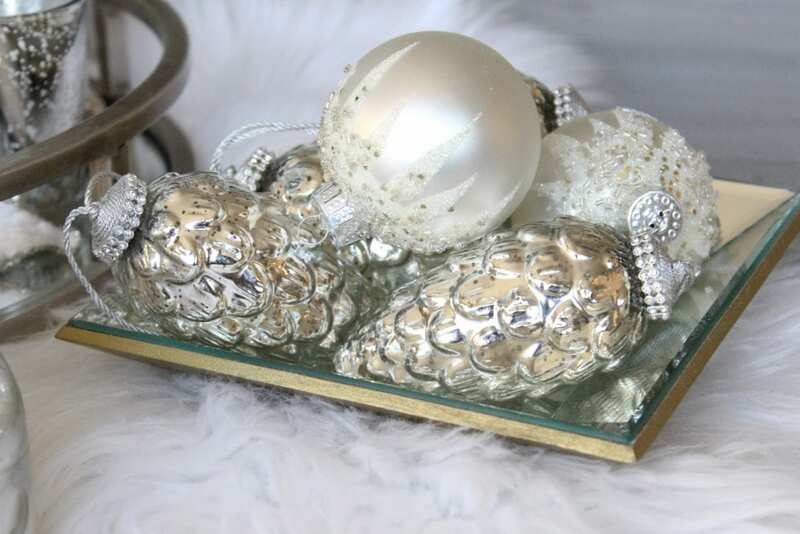 Then there were my favorite mercury glass pinecone ornaments. They’re extra special and I wanted them on display and not on my tree. 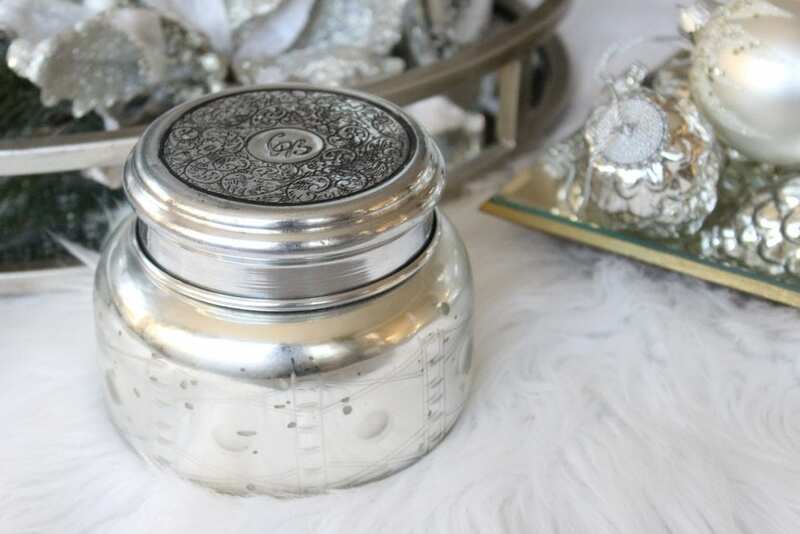 I put them in this pretty mirrored bowl with a couple of sparkly white ornaments. I don’t know about you, but I think this group of elegant items compliment each other perfectly. Oh, and to top it off, I found these exquisite white and silver marble coasters. They’ll sildenafil 100 mg ligne yorumlar be perfect all year long but I’m so happy to find them as I style my Christmas coffee table. How do you style your coffee table? 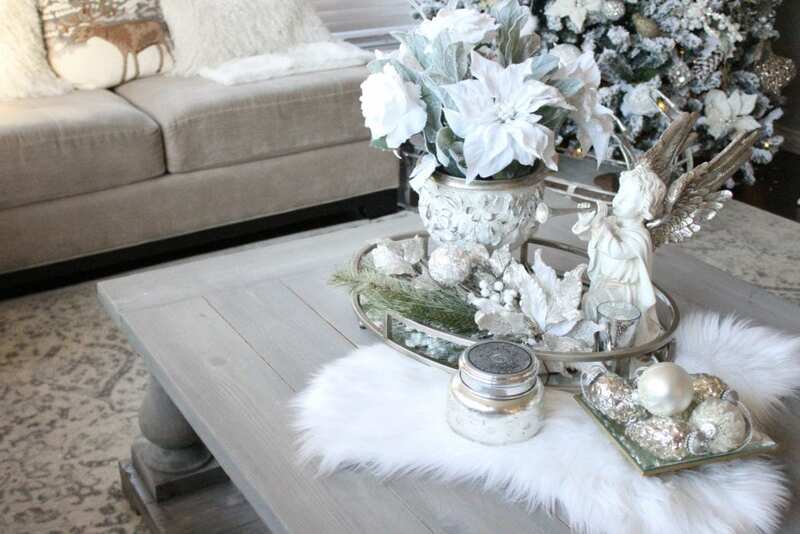 Do you know how you will style your Christmas coffee table yet? Well, I invite you to visit these other friends of mine and continue to gather more inspiration. Thanks so much for joining me today! Here are the shopping links for your convenience of the items from this post or similar items so that you can recreate the look. I’ve would love it if you subscribed to my weekly newsletter at the top of the page for latest blog posts and sale alerts for my shoppe! You can follow me HERE on Instagram and search #StyleThatCoffeeTable for fabulous pictures and ideas. Now, hop on over and visit my fabulous friend, Janine at Happy Happy Nester for a real treat! She always styles her home so beautifully and you’re going to love it! Stunning, I love your angel. So gorgeous Summer!!! Love your fur texture mixed with your beautiful decor. Your style always makes me smile…so lovely, love it! Thanks so much, Joan! That means so much and I’m glad you’re smiling! 😀 Hugs to you!! Love your beautiful, glam style, Summer! And the sheepskin under the tray is genius! Love everything about your table – so elegant and pretty! Thanks, Mysha! This was so fun! Can’t wait to see your gorgeous Christmas decor!!! 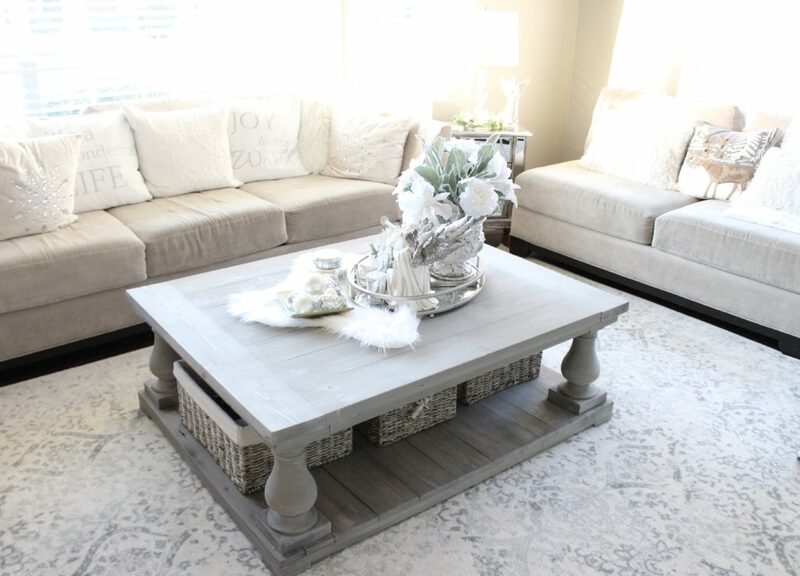 Gorgeous coffee table styling Summer….truly beautiful! You have such a great collection of ornaments. They look beautiful on the mirrored tray! Thanks so much, Oscar! I have a weakness for sparkly pretty things haha! So glam and elegant, Summer! Love the use of an oval tray on your big rectangular table. Esta tudo fabuloso e muito bem acessorizado! Parabens, Summer…. Beijinhos! Thank soooo much! Sempre me das tanto apoio. Obrigada, querida amiga! Beijinhos! Loving the mix of rustic and glam here! The shine and shimmer looks great against the natural wood of the table. And I’m a big fan of those mercury ornaments – gorgeous! So happy to be with you in this hop each month, and to be sharing our blogging journeys together! I finally made it over to your wonderful post! I carefully looked over all your decor and I LOVE it! What great things you found at the Warehouse!!!!! Wow! I just love that round mirror tray, holy smokes it is gorgeous. Also, I just found my Athro candle and I’m going to put it out for the holidays. Yours is so pretty amongst all the sparkly decor. And Oooo I love the ornaments on the table! You nailed your coffee table and I can’t wait to see what you and your mom came up for Christmas! PS sharing over on FB. Beautiful inspiration as always Summer <3 Just love that coffee table! You’re always so sweet! Thanks darling, Martha! you did such a great job. I love every detail. Beautiful as always girl. Summer, beautiful home! I am just in love with your coffee table and I too have been eyeballing the one at RH but yet to pull the trigger. I’d love to see your plans for the diy one sitting in your living room. Did you ever share these on the blog?!? The biggest piece I’m interested in is where you bought the turned legs? But a rundown of how you/your friend did the whole table would be excellent. So beautiful! Wondering where you found your baskets for underneath? If you don’t mind sharing!